Describe the data/specimens to be included. Indicate the sources of data/specimens. Describe the process of acquiring data/specimens, including methods of collecting specimens, if applicable. Submittal requirements – Describe conditions under which data/specimens may be accepted, including the requirement for a signed Submittal Agreement, if applicable. 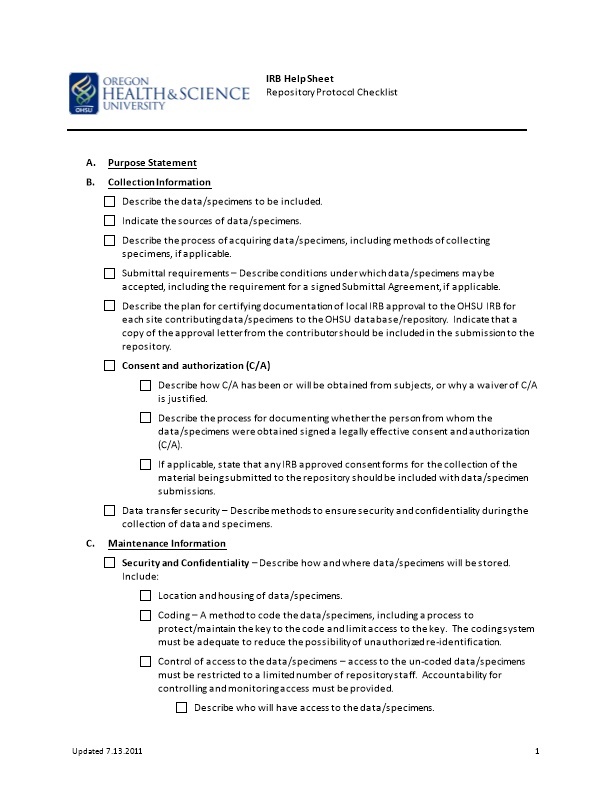 Describe the plan for certifying documentation of local IRB approval to the OHSU IRB for each site contributing data/specimens to the OHSU database/repository. Indicate that a copy of the approval letter from the contributor should be included in the submission to the repository. Describe how C/A has been or will be obtained from subjects, or why a waiver of C/A is justified. Describe the process for documenting whether the person from whom the data/specimens were obtained signed a legally effective consent and authorization (C/A). If applicable, state that any IRB approved consent forms for the collection of the material being submitted to the repository should be included with data/specimen submissions. Data transfer security – Describe methods to ensure security and confidentiality during the collection of data and specimens. Location and housing of data/specimens. Coding – A method to code the data/specimens, including a process to protect/maintain the key to the code and limit access to the key. The coding system must be adequate to reduce the possibility of unauthorized re-identification. Control of access to the data/specimens – access to the un-coded data/specimens must be restricted to a limited number of repository staff. Accountability for controlling and monitoring access must be provided. Describe who will have access to the data/specimens. Describe the requirements for access. Security procedures – a method to prevent unauthorized access to the coded data/specimens (including computer security and specimen storage security measures) must be provided. Description of how the privacy of subjects and the confidentiality of data will be protected, including if a Certificate of Confidentiality (CoC) will be obtained. A CoC is required for sensitive information. Indicate who is designated as the Guardian. Ensuring that data/specimens are received and released according to OHSU policy and the IRB approved repository protocol. Executing a repository sharing agreement each time data or specimens are released for research purposes. Ensuring the security and confidentiality of stored data and specimens. Ensuring the security and confidentiality of data and specimens during transfer. Tracking acquisitions and releases of data and specimens. Maintaining methods for identifying data/samples for which consent has been withdrawn and ensuring no future use. Identifying data/samples that have limitations on future uses and ensuring that future uses are not contrary to those limits. Certifying genetic opt out status with OHSU officials, if applicable. Describe the mechanisms for release of data/specimens. Include a complete description of the process and requirements for requesting and releasing data/specimens. State that separate IRB approval/determination will be required for each specific human subject research activity that uses identifiable data/specimens from the repository. Describe methods for securing and tracking signed Repository Sharing Agreements from recipient investigators, if applicable. Describe methods for verifying that releases of data/specimens are not contrary to any previously imposed limits, via law, previous consent, genetic opt-out, or other applicable limits. Verify that material transfer agreements will be used when necessary for the transfer of biological materials. Data transfer security – Describe methods to ensure security and confidentiality during the release of data and specimens.